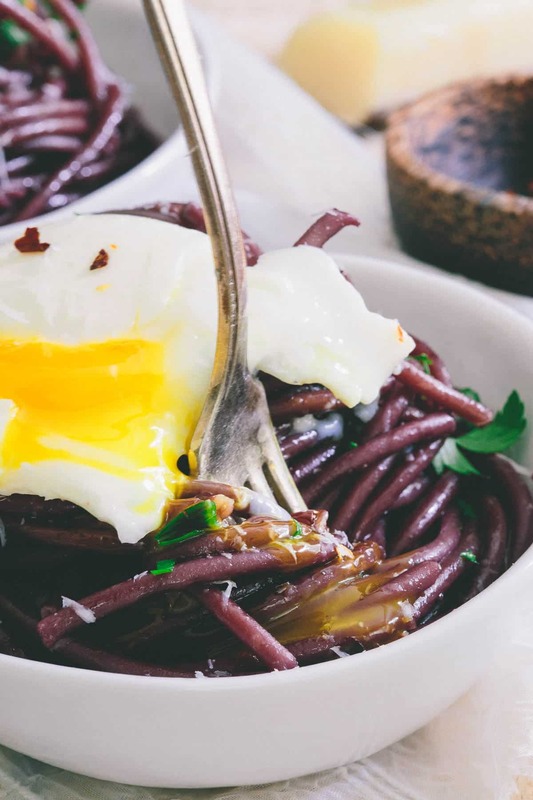 This red wine garlic bucatini is cooked in wine and then sautéed in a red wine garlic sauce. Top it with a soft boiled egg for a stunningly simple dinner. If there’s one food out there that epitomizes comfort for me, it’s pasta. Memories of early Sunday night dinners at my grandparents’ house, walking into a kitchen with sauce bubbling away on the stove, meatballs being rolled on the counter and bottles of wine flowing among the adults, pasta etched it’s way into my heart early on. These days, a house made pasta on a good restaurant’s menu is nearly impossible for me to pass up and while nothing really compares to the pappardelle my great aunt in Italy made by hand and served to us alongside some wild boar bolognese a few years back, I love almost every single shape, type and size it comes in. 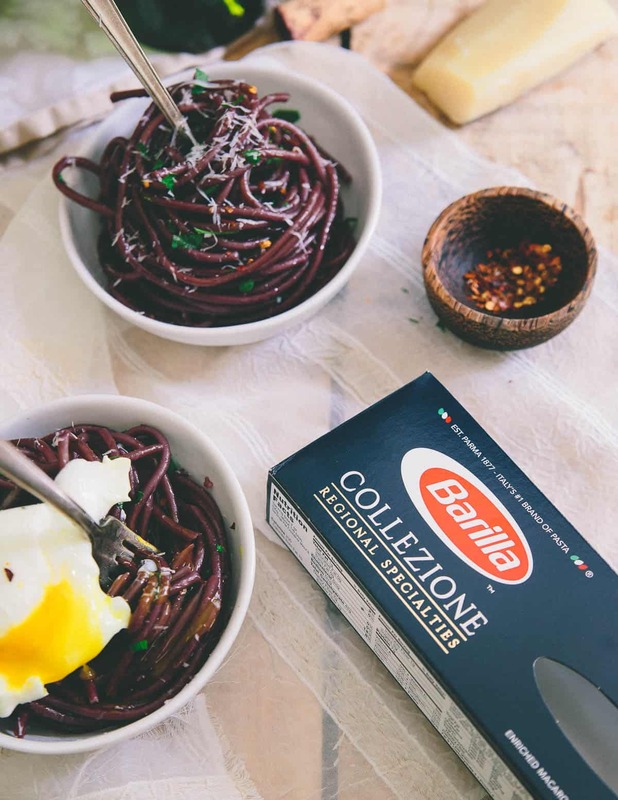 My reaction to finding Barilla’s® bucatini on the grocery store shelf recently was probably a little out of line on the excitement scale but I simply couldn’t help myself. Family dinners were pretty much always the staples: penne, rigatoni, linguine (never spaghetti, my family has a strange aversion to linguine’s rounder cousin for some bizarre reason) and maybe sometimes farfalle if someone got a little crazy that week. So as an adult, I’ve come to love the more artisanal, less popular shapes, bucatini being one of them. Like spaghetti, but with more chew to it (and a fun hole in the center! ), bucatini holds up really well to thick sauces and the like. I immediately imagined it with a hearty bolognese and a full glass of red wine but then my brain went on a tangent when it got to the wine part. Would the bucatini turn red if I cooked it IN wine? 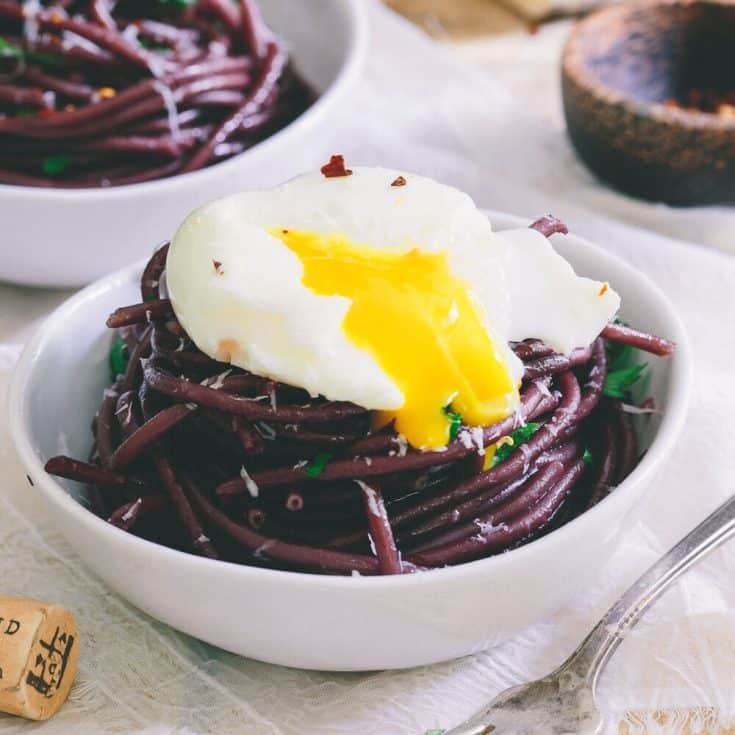 Google told me it would and this simplistic yet elegant red wine garlic bucatini was born. 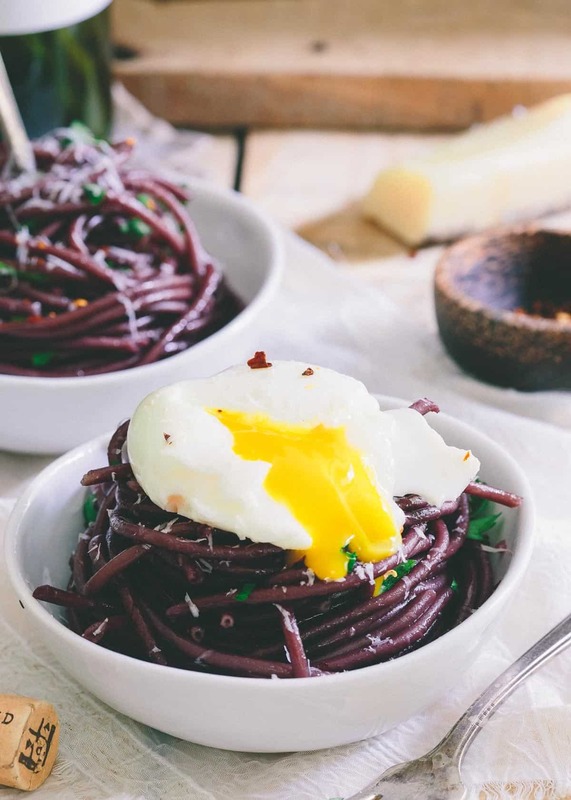 The red wine gives the pasta a deep, almost sweet taste to each bite and adds an element of savory-ness to the meal that goes perfectly with the soft boiled egg served on top. 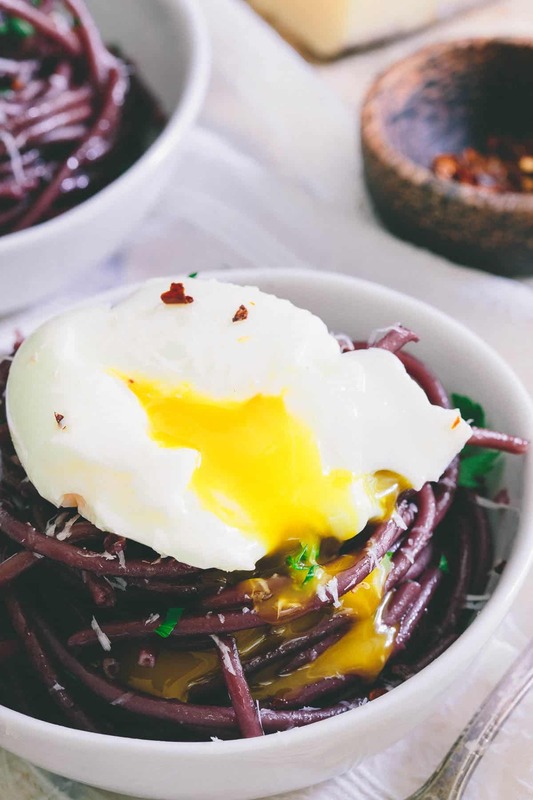 The yolk drips down onto each garlic bucatini strand as you twirl it around your fork and it’s pasta magic at its best. As an affordable pantry staple, pasta can easily transform into a quick dinner alongside healthy fats, vegetables and protein. The yearly meal gap (meals missing in homes of those struggling to put food on the table) in New York City is nearly 242 million which is why today, Barilla® will rally everyone across the five boroughs to #GoOrangeWithBarilla. 500,000 meals will be donated to Food Bank For New York City for New Yorkers in need. Barilla® will also give away 20,000 pasta dinner kits to New Yorkers in a hope to raise awareness around this important mission. Barilla® is also donating another pasta serving for each New Yorker who can donate, advocate online using the hashtag #GoOrangeWithBarilla, or sign-up to volunteer on-site, up to 1 ton of pasta. Pour the 3 cups of red wine and water into a large sauce pot and bring to a boil. Add bucatini, reduce heat slightly and cook until al dente, about 8 minutes. Reserve 1/2 cup cooking liquid then drain the pasta. Place olive oil in a large skillet over medium heat. Add garlic and red pepper flakes and sauté for 1 minute. Add the reserved wine and cooking liquid to the skillet and cook an additional 1 minute. Transfer the bucatini to the skillet, toss until fully coated with the red wine, olive oil, garlic mixture. Garnish with the chopped parsley and grated parmesan. Serve each portion with a soft boiled egg. This looks amazing! This is something that I must try very soon! Wine, eggs AND pasta? Girl, you are speaking my language with this dish! And, can we just have a moment to bask in the perfection that is that egg. YUM. what an absolutely stunning dish!! Obsessed with everything about this dish! 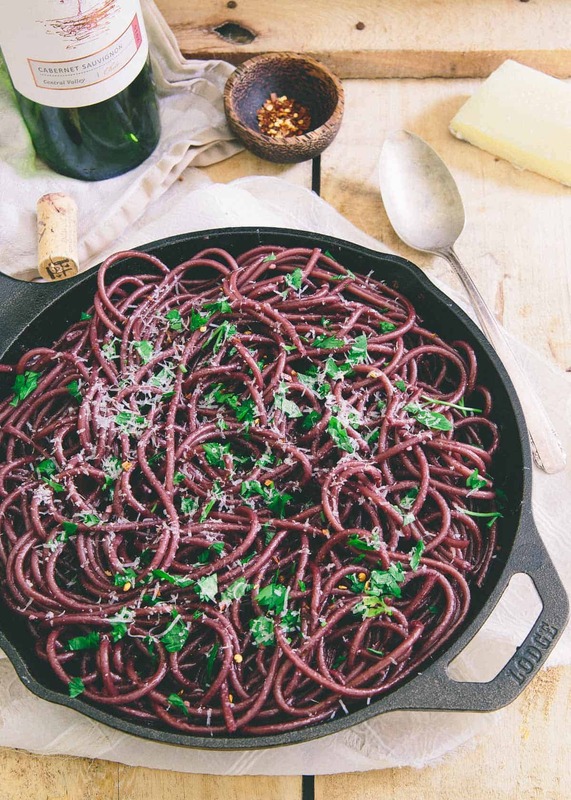 I LOVE Bucatini… and the color the red wine gives it is GORGEOUS. And that egg! Love love love! Does anyone have a good wine recommendation for this recipe? I used a cabernet. You want something good enough to drink but definitely not the best/most expensive wine out there. 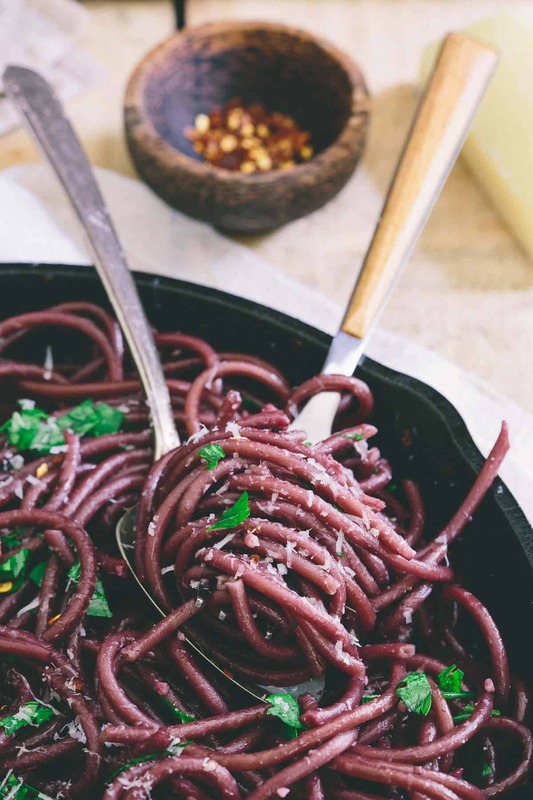 This is just the coolest pasta recipe in the blogosphere right now. I love this idea, it’s just brilliant. Plus the photos are stunning. Love Barilla pasta. have you tried this with other pasta shapes? My son is not a fan of long thin noodles and wondering if it would work with other types. I haven’t but I can’t see why it wouldn’t work.